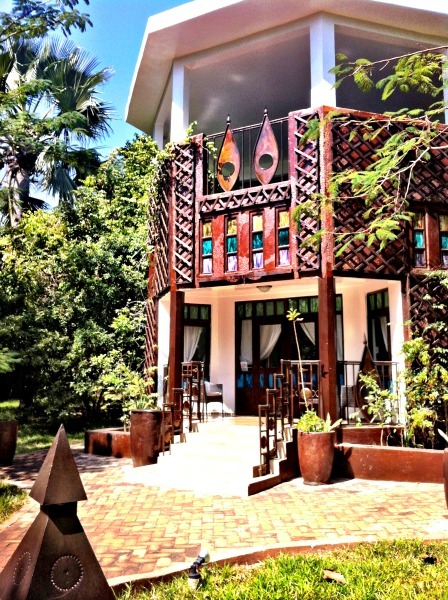 Glowing accounts from a group of travel bloggers' stay at Mandina Lodges, nestled in the Makasutu forest. Early last month three more travel bloggers joined me in a whirlwind visit to The Gambia. Although we were only there a few days, they all loved this introduction to West Africa. Here’s a collection of some of my favourite memories, articles and photographs from this visit. 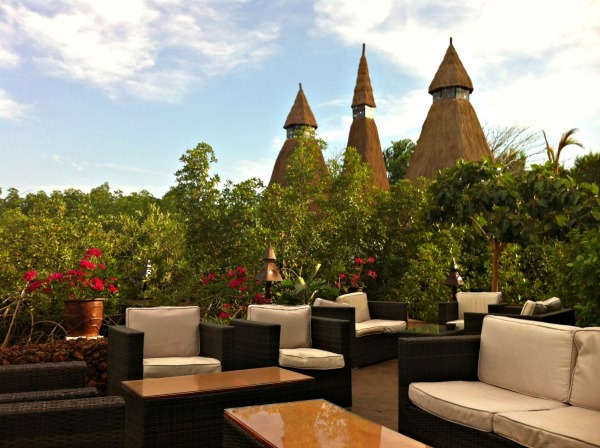 I have worked for The Gambia Experience for over 8 years now and during that time I have made many memorable visits to The Gambia and stayed in some lovely hotels, but there was one, very special place, that I had never stayed at - Mandina Lodges. Here’s an extract from my subsequent article. The previous evening, Jenny sat with me while I watched a spectacular sunset over the mangrove swamps. Mandina Lodges is an eco-friendly resort, deep in the sacred forest of Makasutu with just nine lodges (four floating lodges, one stilted lodge plus four more lodges set back from the river). You couldn’t feel more removed from the hustle and bustle of the main tourist resorts in The Gambia and yet Mandina is less than an hour from Banjul airport. It’s been over eight years since I first saw a photograph of one of these floating lodges. I have dreamt of waking up here ever since. And the experience does not disappoint, it is all I imagined it would be and more." More glorious sunsets featured in Nellie’s post Highlights of Gambia: from River Safaris to Fishing Villages. 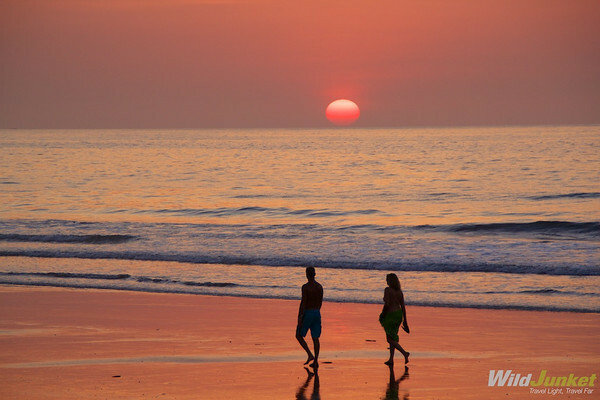 "Every evening the skies put on a spectacular show for us — whether on the beach, in the jungle or by the river. On our first evening at Mandina Lodges, I watched the sun sink into the mangrove-covered horizon, turning the sky into a shade of purple with wispy clouds interspersed between the pink streaks of rays. On another occasion, we were sitting on the wet sands of Kololi Beach when the enormous fireball slowly descended beyond the horizon while horses galloped across us on the beach and tourists strolled past hand in hand." 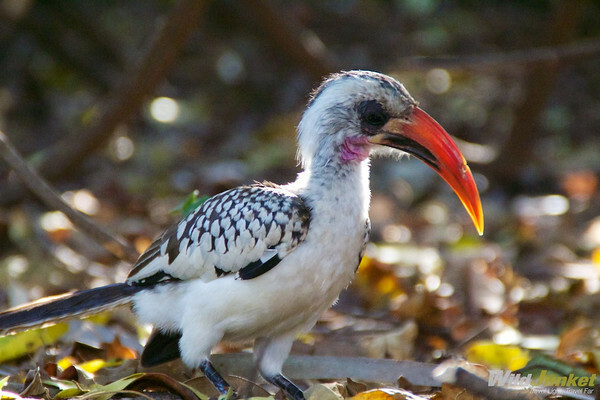 There some other great photographs on Nellie’s blog including this very obliging Red-Billed Hornbill. "Led by the very experienced Malick Suso (lauded as the best bird-watching guide in Gambia), we meandered along a foot path that snakes its way through the woodland forest and spotted several green vervet monkeys and almost 20 different species of birds, including the Red-Billed Hornbill that came just inches away from us." Follow this link for more of Nellie’s lovely photos and to read more of her Highlights of Gambia: from River Safaris to Fishing Villages. "The chef was kind and jolly. He seeks you out in the day to reveal the options for dinner. I tried the fish, the chicken and the beef during my stay, and all were absolutely delicious. I’d definitely vouch for the garlic bread, the soup and the pancakes too. We had a full English each morning – it was the perfect size to keep us energised for the day’s activities without overloading us in the heat." See more photos from Mandina and read more, The Most Incredible Place I’ve Ever Slept. Reading Lee’s post about The Wide Open Wall’s Art Project, happy memories flood back of our visit to Kubuneh... "The most memorable parts of a trip abroad don’t always turn out to be the things you were expecting – going to see the Pyramids in Egypt but being blown away by the sand dunes and desert oasis in Siwa, for example – and on a recent trip to The Gambia this proved true once more.... The village of Kubuneh is a short dug out-canoe ride away from the gorgeous Mandina floating lodges in the Makasutu Forest, and a walk here will reward you with both an insight into typical rural African village life and seamlessly integrated art work. The Wide Open Walls project is the brainchild of Lawrence Williams, a talented artist and one of the co-founders of Makasutu / Mandina. 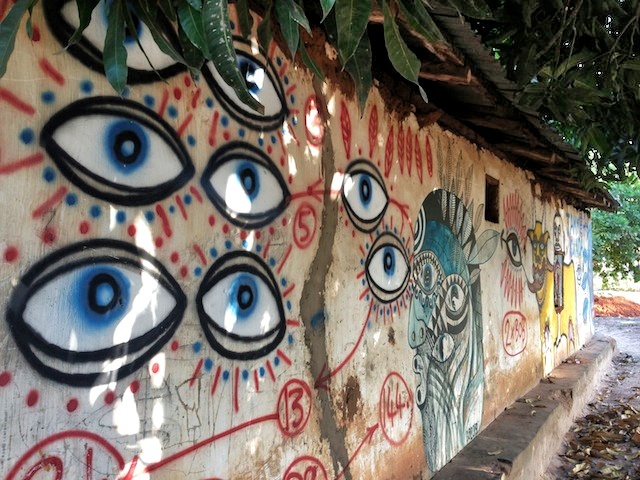 Although street art is relatively common in the west, aside from artistic advertising I haven’t really seen it much in the African countries I’ve visited, making this venture a ripe opportunity to try something new. Wisely avoiding a typical art gallery set-up in a single building, the idea here is very much that of a 'living artwork', where the village itself becomes the canvas." Read more about Lee’s walk around Kubuneh and see more of his photos in his post The Wide Open Walls Art Project. More highlights from #BlogGambia coming soon.